italiano The CCD images have been taken by Enrico Prosperi, an italian electronics engineer, from his home-observatory at Larciano, a little town near Florence, in a suburban environment at 60m over the sea level. The balcony where the telescope is installed is located no more than 60m away from a pub and 150m from a soccer playing field whose lights are often on during the observing sessions. The telescope is a Meade SSC-10 equipped with the Computer Drive System (CDS #1697), the german mounting version of the more known LX200. 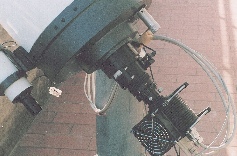 The CCD camera is the french Hi-SIS 22, developed by the team of Christian Buil, a pioneer in the utilization of this type of sensors in astronomy. I operate from inside by means of a computerized remote control. 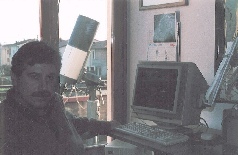 Two personal computers supersede all actions: one is linked to the telescope CDS while the other is connected to the CCD camera. Enrico Prosperi graduated in Electronics Engineering . He was then concerned with infrared and microwave radiometry, applied to bio-medicine and remote sensing. On such topics he also collaborated, as an external consultant, with electronic industries and with research institutions, developing a good experience in the field of digital image processing. Since 1984, he is a professor of Electronics in the Technical High-Schools and currently teaches Telecommunications at the I.T.I.S. "Silvano Fedi" in Pistoia, Tuscany. Amateur Astronomer since he was still a boy, he resumed the ancient passion installing next to his residence the above described instrumentation, in the years 1993-94. Since 2004 the observatory was enriched with a LX-200 GPS 14" scope and ST-7EI, ST-9XE and ST-1001E SBIG cameras. In the years 1999-2004 he cured the deep sky column on the montly review 'l'Astronomia'.